Son. Husband. Father. Friend. Christ Follower. EE. Cyclist. 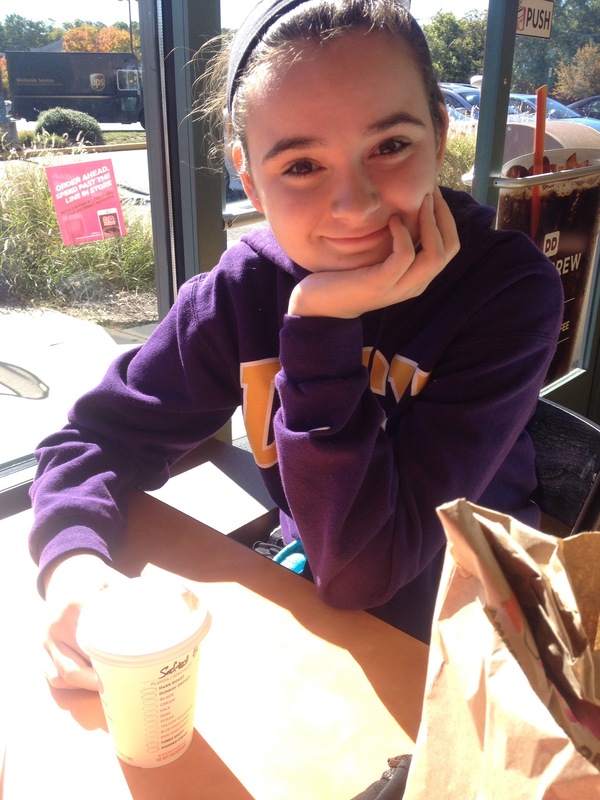 I live in Reston, VA with my wife, Jennifer, and three daughters: Anna (17), Sarah (15) and Becca (8). I am 44. I graduated from LSU in Baton Rouge with a BS in Electrical Engineering. My parents still live in Mansfield, Louisiana, near where I grew up. 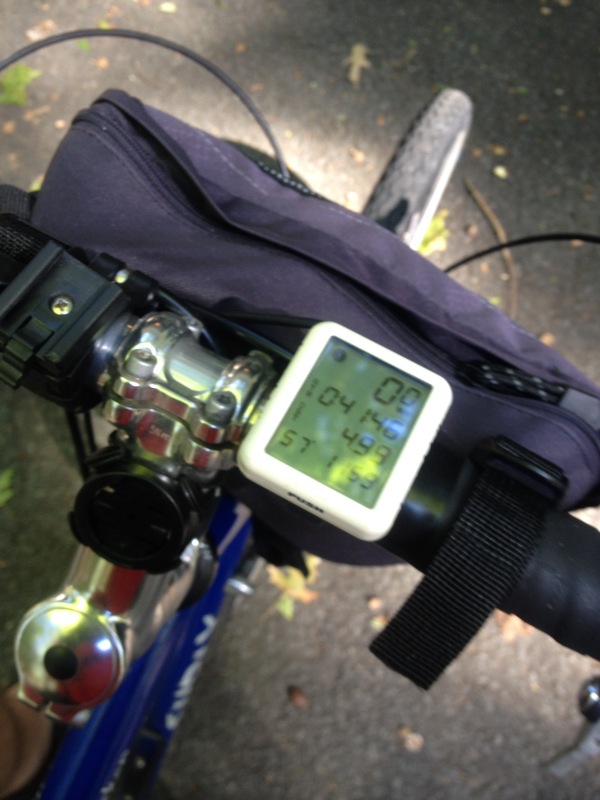 About five years ago, I discovered that I could commute to work, run errands and go places on a bike. I like the idea of saving money, getting exercise and doing something productive all at the same time. 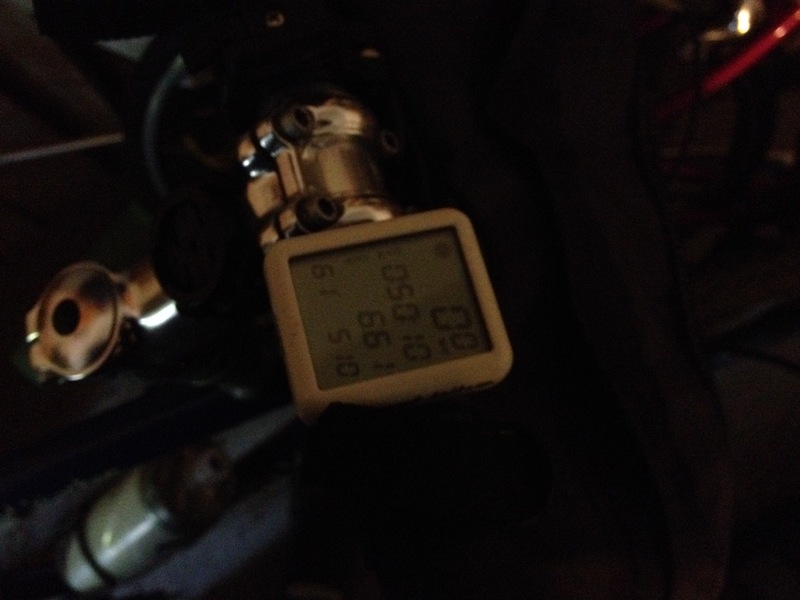 : ) Since I bought a blue Surly Long Haul Trucker from REI in the fall of 2012, I have ridden over 9000 miles. Most of the miles are from riding back and forth to work, but I have also ridden 25 miles into DC to watch a Nats game or two and done a few week-long bike tours. In September when I heard about the Coffeeneuring Challenge posted at chasingmailboxes.com, I was immediately all in. 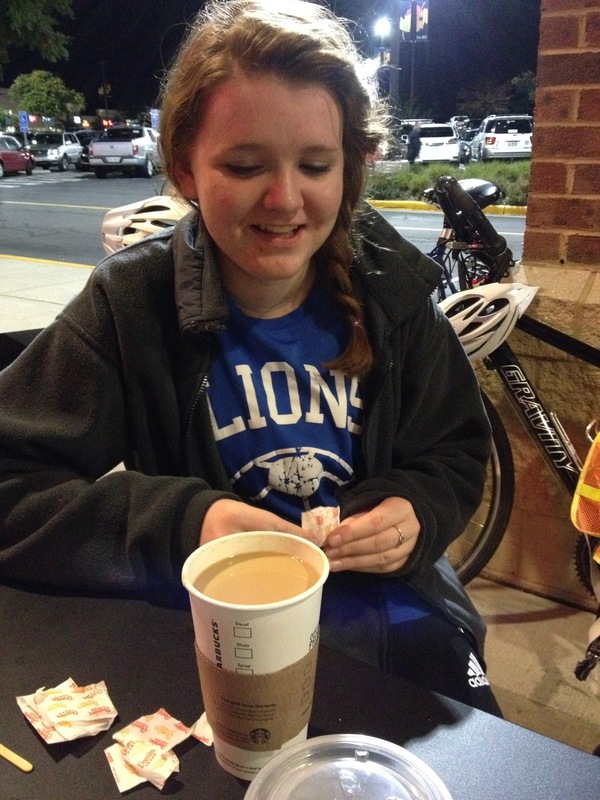 My second daughter, Sarah (15), was in as well as she has recently discovered coffee and also likes biking. My other daughters are also in, but they are not really interested in coffee but they would be more than satisfied with “coffee”. My wife likes coffee and might come along on a ride or two, but only out of guilt as she is not really that into biking and she has other established ways of getting her coffee. 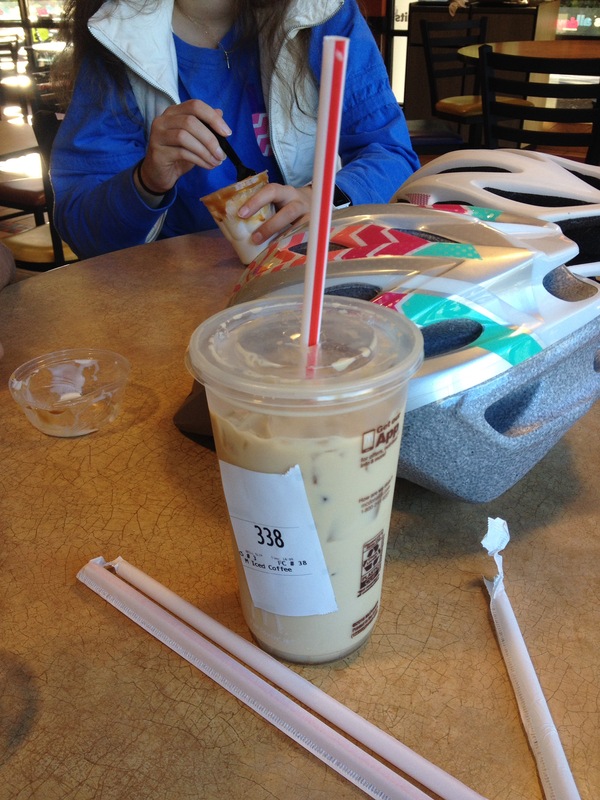 If you have not heard of coffeeneuring, it basically boils down to this: over the course of 7 weeks (starting 7 Oct 16), ride your bike 7 different places, at least 2 miles round-trip each time, drink 7 cups of coffee (or similar), and take 7 pictures as proof of your coffeeneuring. If you complete the challenge and send chasingmailboxes.com 5 bucks, they will send you a prize. 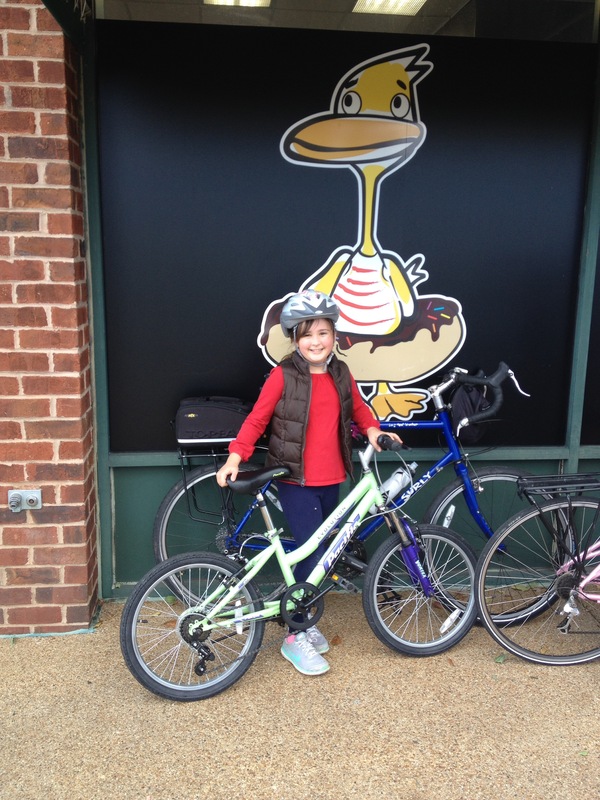 The Green Lizard Bike & Coffee Shop in Herndon. 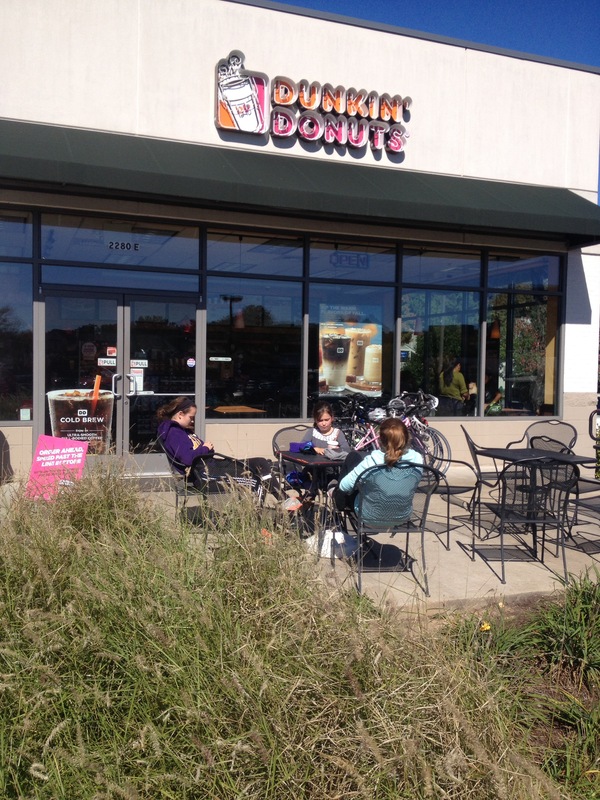 The Duncan Donuts in the Hunters Woods Shopping Center in Reston. Pitango Gelato in Reston Town Center. Ebenezers Coffeehouse on Capitol Hill. *We might not be able to visit all of the places above, but at least we have several great options. Also, the options are not in priority order. And not all of the options are listed. Anna: Small Salted Caramel Hot Chocolate. Lemon Filled Donut. Sarah: Medium Coffee with Cream and Sugar. Boston Creme Donut. Loved the pastry but thought the coffee was a little bitter. 4/5 stars. I would give it a 4.5 out of 5 stars. We rode mostly on trails. 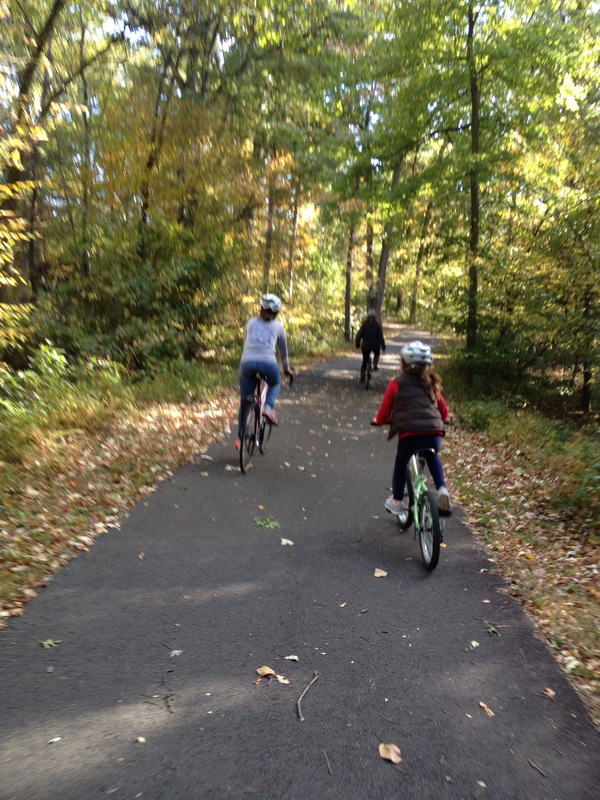 Reston has a great trail network. There was even a tunnel that took us under a busy intersection. I subtracted half of a star because of the hills going south-to-north in Reston, and the lack of bike racks at the donut shop. Distance: About 4 miles (6 km) round trip. Sarah.. Grande Pikes Peak Roast Coffee with cream and sugar. Dan… Tall decaf americano with cream and sugar. This was a late evening ride on a school night. We left around 7:45 pm to try to get a ride in before Sarah has her wisdom teeth removed on Friday, which will mean that she won’t be able to ride for a week or so… 😦 The weather was great. It was in the 60s with a slight breeze. You got to love it. 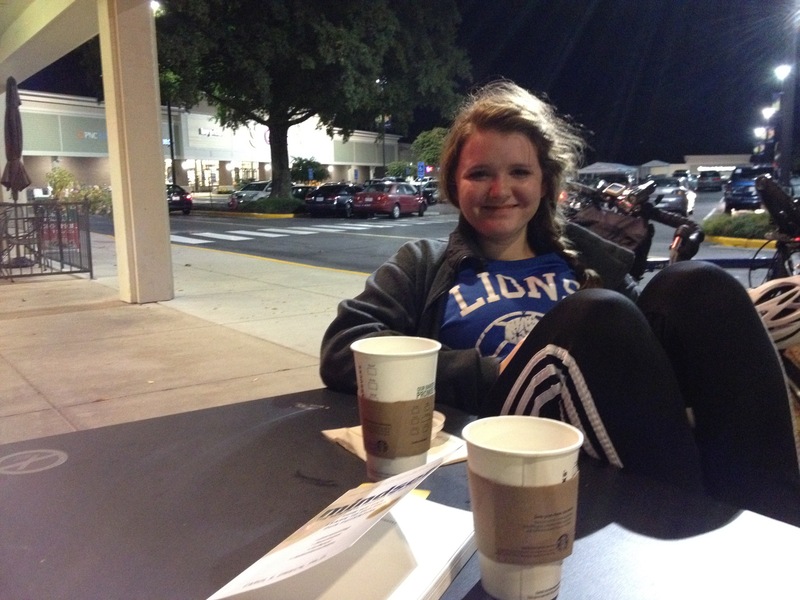 We arrived at Starbucks a minute after closing time and they were nice enough to serve us. So, I would like to give a shout out to the guys at Starbucks at Fox Mill who were working the closing shift. I would give the route/location 4/5 stars. There are bike lanes most of the way there, but you have to negotiate a busy intersection (Lawyers and Reston Parkway) to get to the coffee shop. I did not see a good place to lock the bike up near the coffee shop. 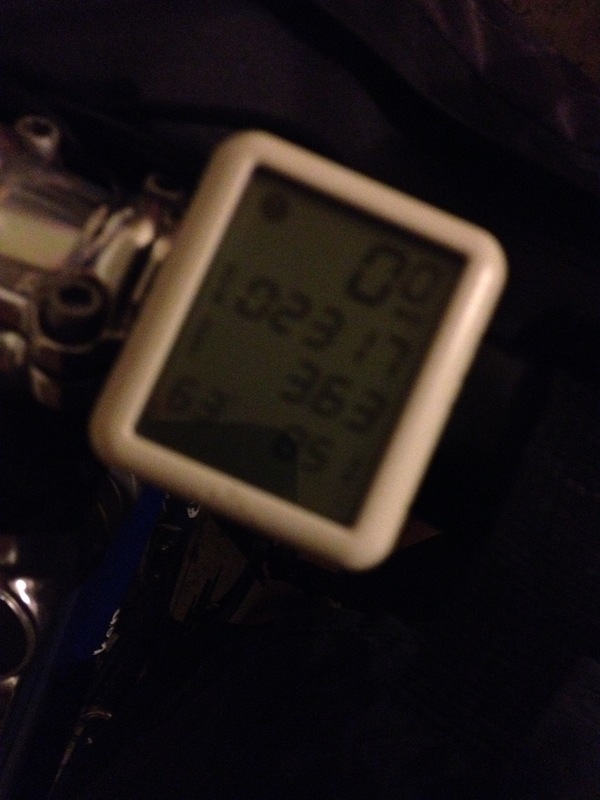 Dan: 2 Rides… 9 miles (14 kms) total. 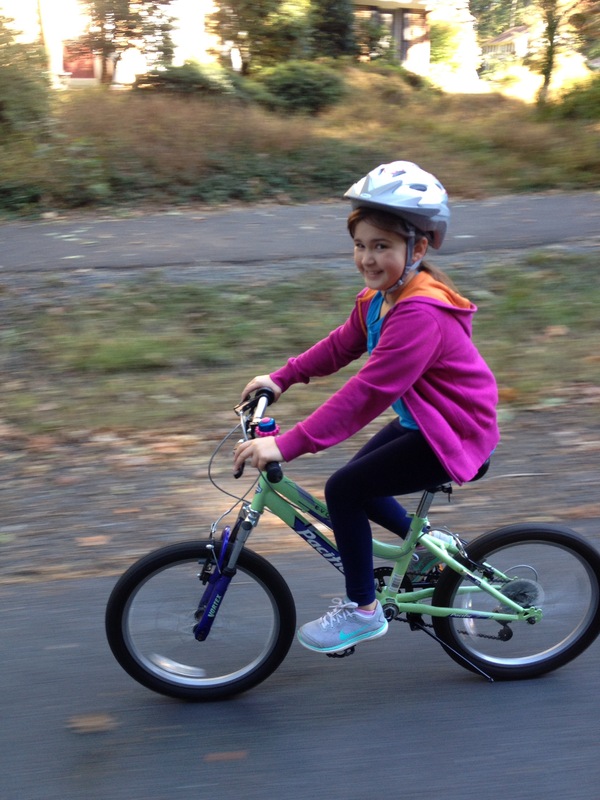 Sarah: 2 Rides… 9 miles (14 kms) total. 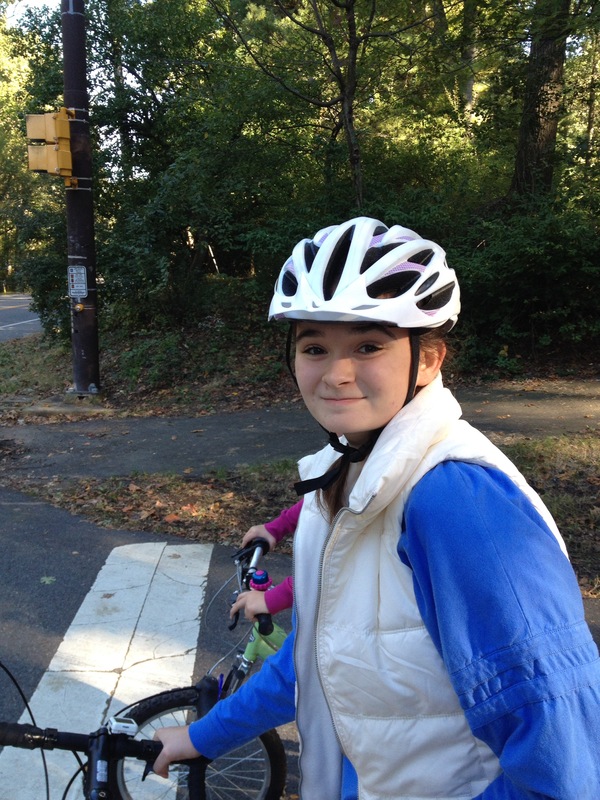 Anna: 1 Ride… 5 miles (8 kms) total. 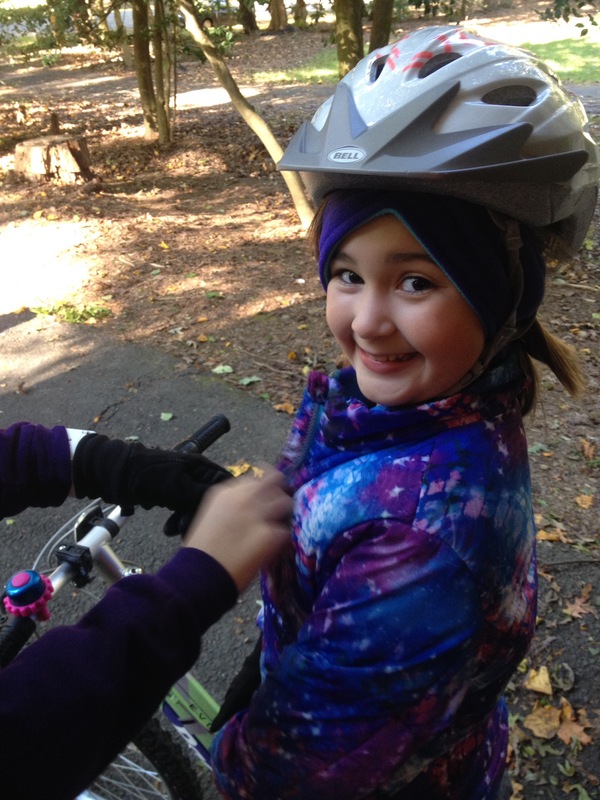 Becca: 1 Ride… 5 miles (8 kms) total. Jennifer: 0 Rides. 0 miles total. I am kind of bummed that the Nats were knocked out of the playoffs by the Dodgers earlier last night. It was especially bitter as I stayed up until around 1am only for them to lose. And, then, I had to be up at 6am for work. But, I am hopeful that LSU will turn things around and win a decent bowl game this year… Also, I need them to win at least 7 games this year as I have a bet going with a friend who is an extremely enthusiastic Bama fan. Geaux Tigers! I am also hopeful that the Nats will do better next year! I figured I should let everyone know that the procedure to remove Sarah’s wisdom teeth went ok. She is in pain, but doing ok. She should be able to ride again in a week or so… Stay tuned. Destination: McDonalds in the Reston Mc Taco Hut Complex in Reston. Mileage: 7 miles (11 kms) round trip. It was a beautiful day for a bike ride. It was sunny, 65 degrees with almost zero humidity and no wind. I wish every day was this nice. I learned that Becca, who is eight, wants to do a scavenger hunt at her next birthday party in January. I would give the route/location 3.75/5 stars. 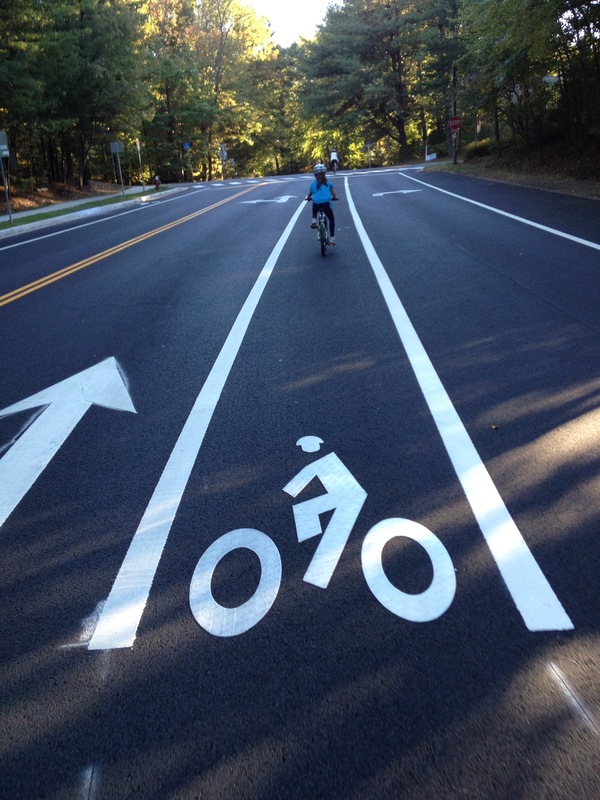 There are bike lanes or sidewalks most of the way there, but you have to negotiate a couple of busy intersections (Soapstone/Sunrise Valley and Wiehle/Sunset Hills) to get to the coffee shop. I did not see a good place to lock our bikes to, so we just leaned them up to the side of the building and locked our bikes to each other while we were inside the restaurant. Dan: 3 Rides. 16 (26 kms) miles total. Anna: 2 Rides. 12 (19 kms) miles total. Sarah: 2 Rides. 9 (14 kms) miles total. Becca: 2 Rides. 12 (19 kms) miles total. Jennifer: 0 Rides. 0 miles. In Season 2, Episode 2, Jerry Seinfeld and David Letterman had just sat down for coffee and Dave says to Jerry… “You’re not drinking coffee if you’re NOT drink’n it black… don’t you think? ” Without pausing, Jerry says … “No I don’t think” as he is putting cream in sugar in his coffee. And Dave responds “You like to monkey with it?” and then just changes the subject without a response from Jerry and as if the previous exchange never happened. I thought that was very funny.. I am not sure why? He… Heeeee! Destination: Duck Donuts in Herndon. 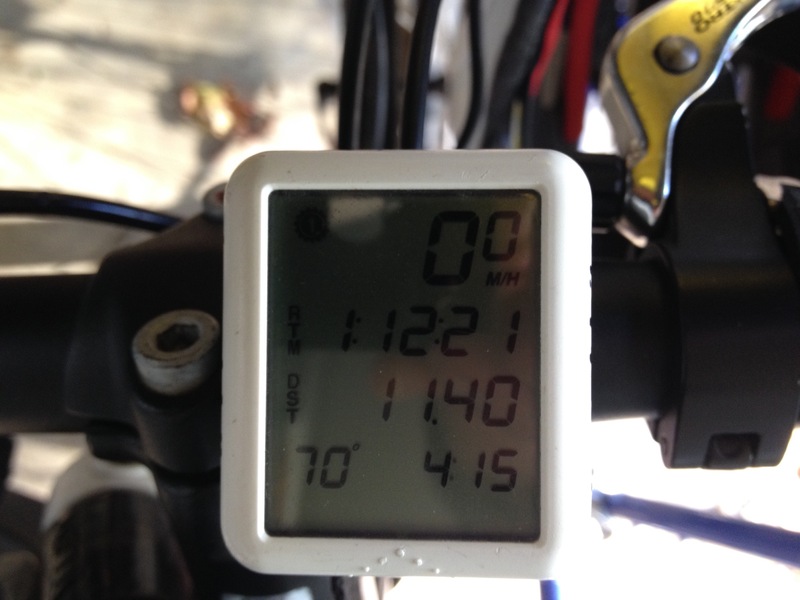 Mileage: 11 miles (18 kms) round trip. Dan: Medium Black Iced Coffee. 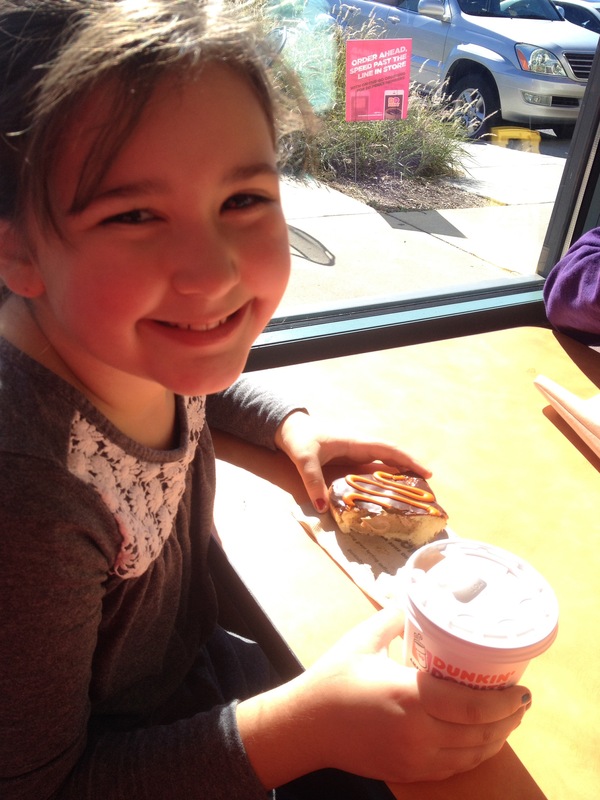 Anna: Milk with a Donut topped with Maple Frosting and Salted Caramel Drizzle. 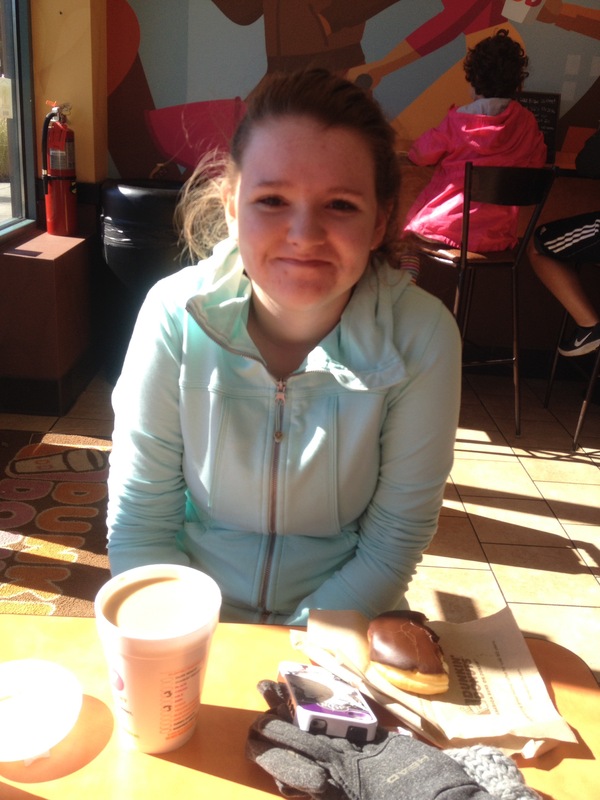 Sarah: Medium Iced Coffee (with Cream & Sugar) with a Donut topped with Strawberry Frosting and Bacon. Becca: Chocolate Milk with a Donut topped with Vanilla Frosting, Oreo Pieces and Hot Fudge Drizzle. 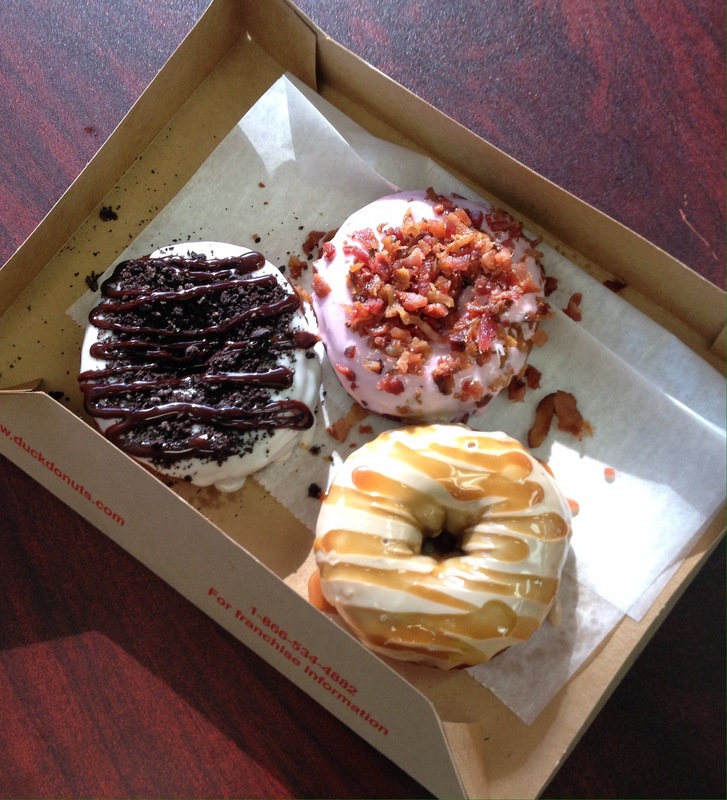 How did we like Duck Donuts? 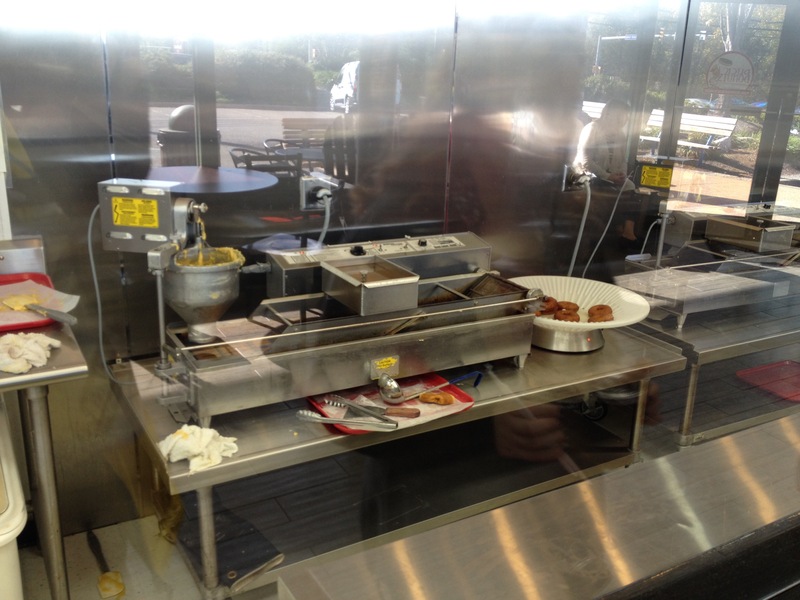 I think Duck Donuts originally started in Duck, North Carolina in the Outer Banks. And I think they opened one here because so many people around here go to the Outer Banks on vacation. We went to the one in Nags Head when we were at the Outer Banks last summer. When inside the shop, it felt like we were back at the beach. A Jimmy Buffet song was playing. It felt warm and relaxed. 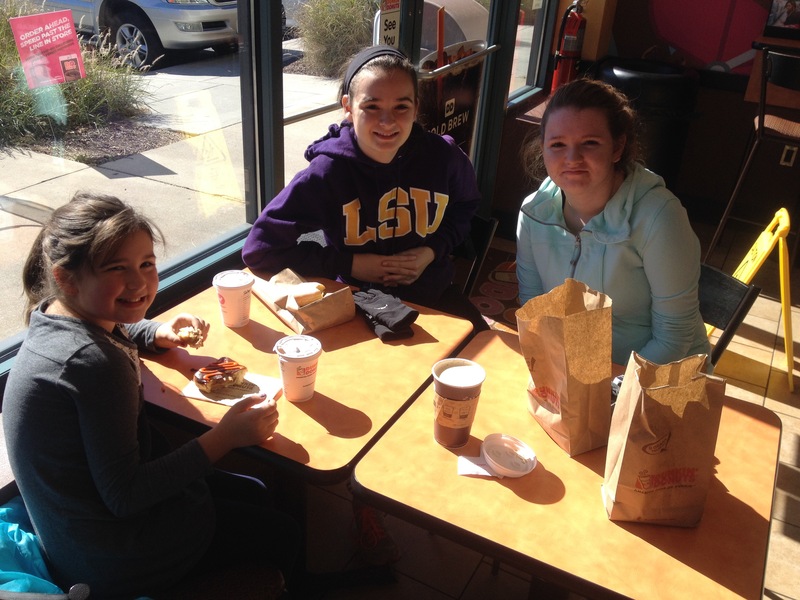 The girls loved the donuts. 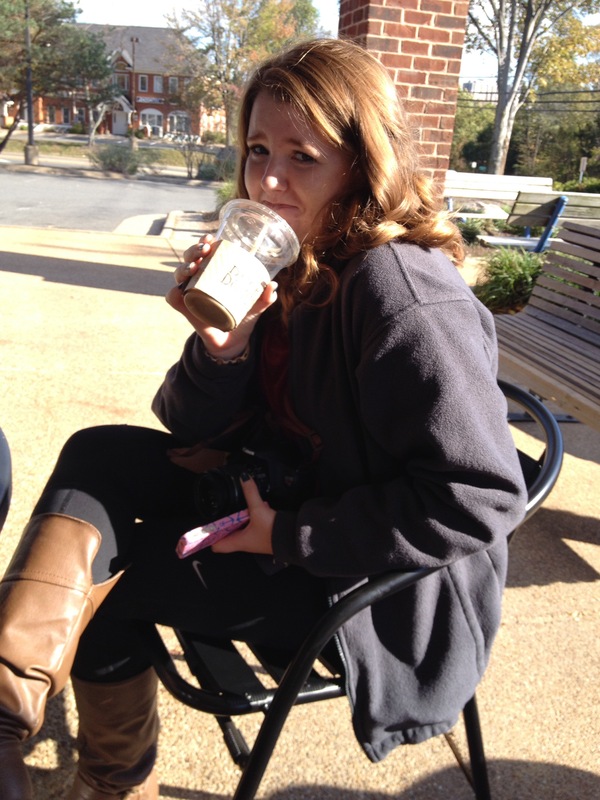 I thought the coffee was good. It was a little bitter–more so than if it had been cold brewed. But it was fine. 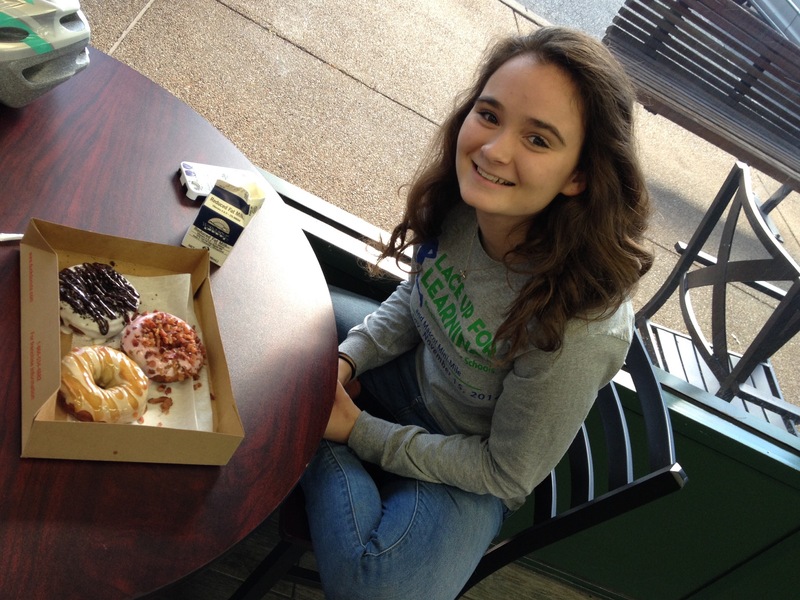 The donuts were the main attraction and they did not disappoint. 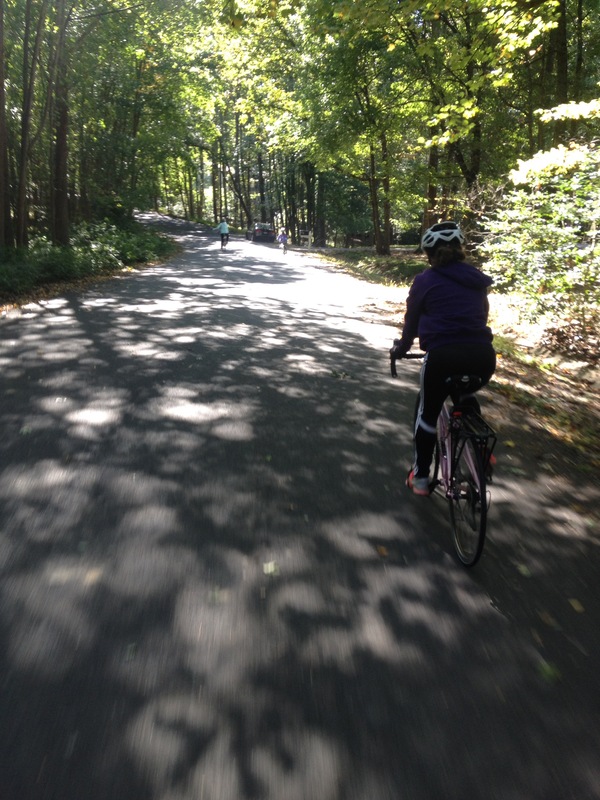 It was a beautiful day for a bike ride. Fall was happening. The wind was blowing and leaves were falling. It was sunny and around 70 degrees with almost zero humidity. Do you know what happens when a man with experience meets a man with money? The man with experience gets the money and the man with the money gets the experience. I would give the route/location 4.5/5 stars. From our house in South Reston off of Lawyers Road, we took the Reston bike paths to Steeplechase Rd past the Hunters Woods Elementary School towards the garden plots and then up the trail beside Reston Parkway toward Glade Drive. 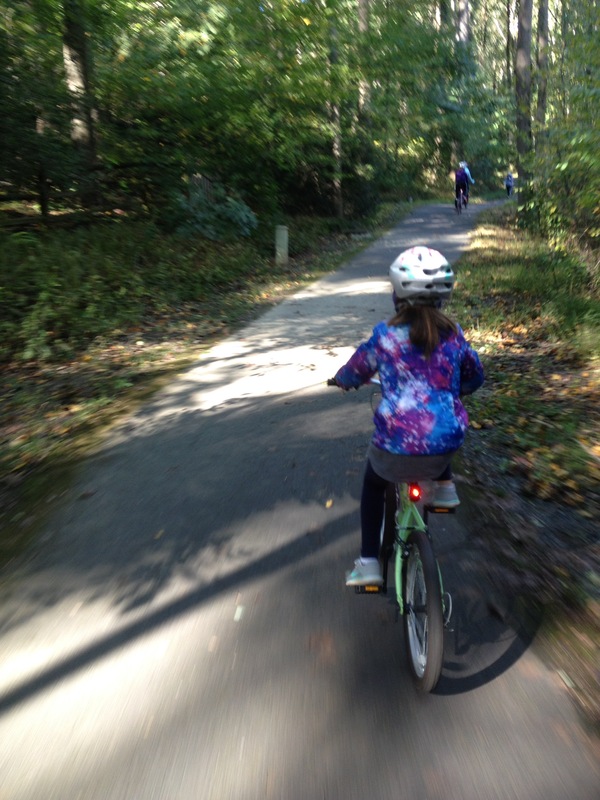 We then took Glade Drive across Reston Parkway down to the Fairfax County Parkway Trail to the WO&D Trail and finally followed the Sugarland Run trail, which plopped us out right at the donut shop. We used Google Maps to get bike directions. It usually works ok. I did not see bike racks for our bikes, so we just leaned them up to the side of the building and locked our bikes to each other while we were inside the restaurant like we have done at other places. Dan: 4 Rides. 27 (44 kms) miles total. Anna: 3 Rides. 23 (37 kms) miles total. Sarah: 3 Rides. 20 (32 kms) miles total. Becca: 3 Rides. 23 (37 kms) miles total.